When remodeling your home, a lot of waste is created. Waste that cannot efficiently fit into normal size bins. Therefore, requiring you to rent a dumpster. This will keep all your dirt work, to enhance safety while working and also to clear way for work to be done. A dumpster is also a great way of holding clutter if your renovation project is aimed at creating more space. Anyone that is doing construction work and hauling away a lot of trash realizes that it takes a tremendous amount of time and effort to sort out the trash, place it in a dump truck, and haul it away. The fact is that it is a time consuming task that uses up a lot of energy, time, and money. Certainly, there is a much better solution. The fact is that renting a dumpster is a way to streamline the entire process and work more efficiently. 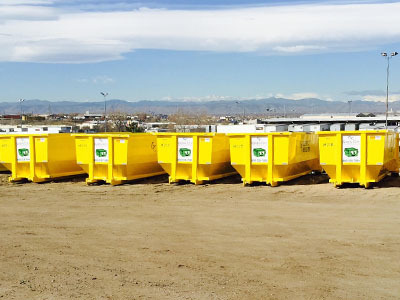 Dumpster rental in Denver is an easy process, but if you're renting out a dumpster for an extended time, you'll probably notice that the dumpster is developing an obnoxious odor. Hold on, there is no reason to panic. Here are a few suggestions to help keep your dumpster clean and odor free during the entire rental period. What do most people know about renting a dumpster? They probably know a lot if they work in the construction or commercial industry. Most people only need to rent a dumpster on a rare occasion. Knowing the rules of dumpsters can make the process easier. It may also save the consumer some money. If you've taken on a home renovation project, whether it's a new roof or a kitchen remodel, it's likely you'll find that your regular trash bins aren't enough to handle the debris. It may also be illegal to put certain things into household trash that could wind up as contaminants in a local landfill. 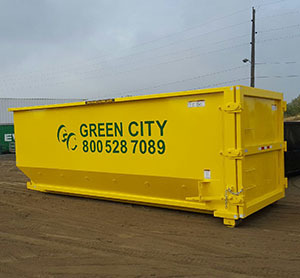 If you're planning a major project or just a major clean out of the basement or attic, you might want to consider renting a portable dumpster or larger industrial trash container. A dumpster will give you a single place to toss all that junk and debris that a professional service can easily deliver and haul away for you. Professionals can also ensure that you're in compliance with any local regulations on what you can and cannot put in a dumpster. When it comes to home renovation, landscaping or other construction projects, it’s hard to call it a masterpiece until it is finished; until then, you’re stuck with the unsightly mess of dirt and debris. A mindful solution to saving time and money during your project is to get a roll off dumpster. Here at Green City Waste & Recycling, we know how projects can be; how long they last, and how much stress they bring. During our time serving the Denver Metro area, our service has provided peace of mind and time to all of our renters. 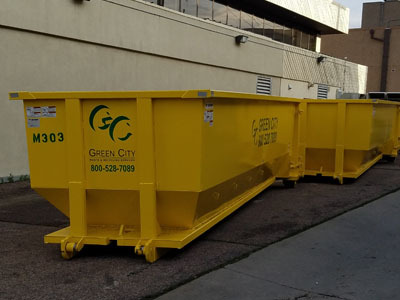 Let us show you why a roll off dumpster can be beneficial for your next project.